AmSafe airbag seat belts have been installed for the front and rear seats of AOPA’s Sweepstakes Super Cub. 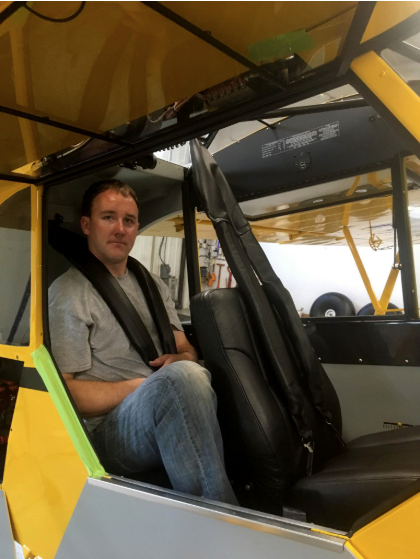 Baker Air Service and an AmSafe technician installed the supplemental type certificated four-point seat belts on July 11, just days before the Super Cub launches on an eight-hour flight from Baker, Montana, to Oshkosh, Wisconsin, for EAA AirVenture. The system detects a crash event within milliseconds and deploys the airbags (located in each shoulder harness) away from the occupant. The airbags add a layer of protection, preventing the rear seat occupant from hitting his or her head on the back of the front seat and protecting the pilot in the front from slamming his or her head into the instrument panel or the V-shaped airframe bars running from the middle of the panel to the top corners of the fuselage. The airbag will deflate after deploying to make it easier for the pilot and passenger to get out of the seat belt and the aircraft. “Hard landings, vibration, or turbulence” won’t trip the system and make it deploy, according to AmSafe’s system operation documentation. The only maintenance required is an annual inspection and functional testing. The functional testing is also required any time its components have been disconnected and reconnected, removed and replaced, or “when the aircraft receives a post-incident inspection.” The system in the Sweepstakes Super Cub requires a special diagnostic tool in order to perform a functional test. The electronics module assembly, which contains the system’s electronics and power, is mounted to the Super Cub’s structure and must be sent to AmSafe after seven years for refurbishment. After 14 years (starting from its manufacture date), it must be removed and disposed of. The inflator assembly is good for 10 years, after which it must be sent to AmSafe for disposal. AmSafe kits come standard on some new aircraft, like Cessna singles, Cirrus, Diamond, and Mooney aircraft. But retrofits, such as the one for AOPA’s Sweepstakes Super Cub, are also available. AmSafe airbag seat belts have been installed in the AOPA Sweepstakes Super Cub. The airbags deploy away from the occupant for an increased level of safety. Photo by Roger Meggers.